POLL: Have you ever visited Fall Creek Falls? NASHVILLE — The Haslam administration has received approval from the State Building Commission to rebuild the guest lodging at Fall Creek Falls State Park. 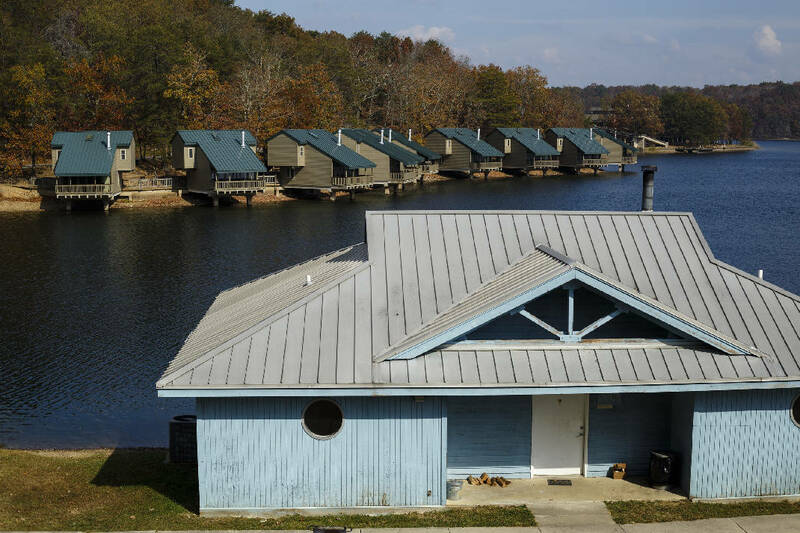 The plan is to tear down two existing facilities and build a single inn with about 85 rooms along with a new restaurant and conference center at the 26,000-acre park, long considered the "crown jewel" of Tennessee's state parks system, on the Upper Cumberland Plateau. The work is expected to take 1 1/2 to two years. The Tennessee Department of Environment and Conservation would continue to operate the inn and restaurant. Republican Gov. Bill Haslam threw in the towel on his plan to outsource park hospitality in May after vendors twice showed no interest. Job guarantees for those state workers and recompense for the loss of tax revenue have been two points of serious concern for local officials and lawmakers. 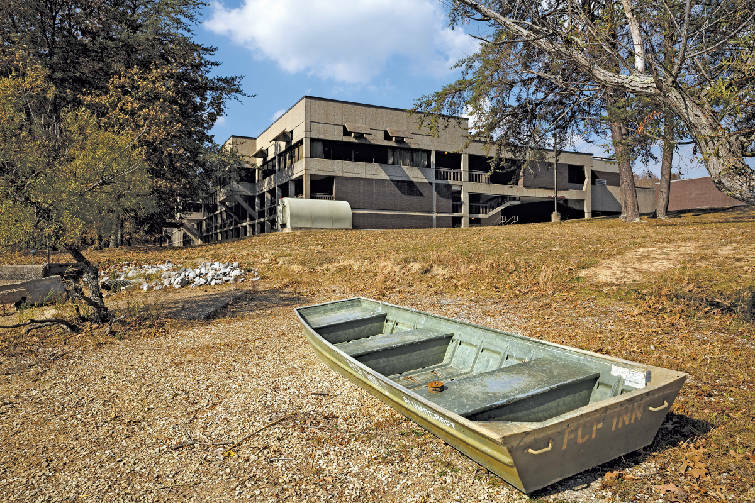 A boat is beached near the inn at Fall Creek Falls State Park in November near Spencer, Tenn. A plan to demolish the park's existing inn and replace it with a new facility that is privately run has garnered no bids. They caused Sen. Janice Bowling, R-Tullahoma, to take a lead role in opposing Haslam's park privatization attempts. She sought to protect employees' jobs during construction and to address Van Buren County officials' concerns over loss of tax revenues from the inn and restaurant if the venue was privately managed. Bowling said Friday she understands the project may get underway in May. Efforts to reach a TDEC spokesman were unsuccessful. In their Nov. 9 meeting, building commission members voted to cancel a years-old plan to renovate the park's main inn, then approved TDEC Commissioner Bob Martineau's request to go forward with rebuilding. "The state of the facility dictated doing a more complete rebuild of that project," Martineau said in a video recording of the meeting. Lt. Gov. Randy McNally, the Republican Senate speaker, put Martineau on record on addressing Van Buren County officials' concerns over compensation for lost tax revenue during closure. Only about 5,000 people live in Van Buren County, and the park is a major local revenue source. "I think the administration had worked with the county, it's a very small county, to ensure that it doesn't disrupt the tax base," McNally said. He noted that Bowling, Sen. Paul Bailey, R-Sparta, and Rep. Cameron Sexton, R-Crossville, all had joined him during an October tour of the inn. Martineau said he and Finance Commissioner Larry Martin talked how to handle the tax losses in what he called the "bridge time" during construction. He said opening the new inn and conference center is expected to bring in more tax money than the old facility did. "We're going to work with them to recognize the impact in the short term that that will have on Van Buren County," he added. Bowling favored the original plan to renovate the main inn, which she said would have allowed operations to continue with less disruption to tax revenue and employment. The second, smaller inn is in better shape and could have been kept open, she added. Renovating the facility would cost $12 million to $15 million, she said, compared with Martineau's $25 million estimate to demolish and rebuild the inns and restaurant and add the conference center. Martineau has long insisted both the inns are so dilapidated they need to be replaced. "We were going to get to the point where we were going to have to close the inn at some point because it was unsafe," the commissioner told the Times Free Press in September. "In many cases, the HVAC systems are hanging on by a thread. We've had periods of time recently where just even the stairs to the thing had to be taped off. Chunks of concrete are falling on cars and stuff." It's "becoming a safety hazard as well," Martineau added. Another building commission member, state Treasurer David Lillard, then brought up the issue of employees, citing it as an additional concern of Bowling's. 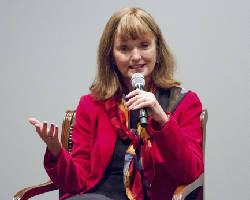 "The administration's been working with the employees also, so I appreciate that," Lillard said. Martineau replied, "Yes," but he did not elaborate. Bowling said Friday she has been told the department would try to retain as many workers as possible during construction. "This is the promise, the assurance, [keeping] every one of them possible and that should be the majority who should stay," she said. The park also operates cabins, lodges, campsites and a welcome center. For employees not finding work there, Bowling said, "they will be the first in line to get the jobs offered back to them at the new inn." She also said she's been assured that if there is "absolutely nothing" for some during the construction period, "they would be getting state jobs in that immediate area." Randy Stamps, executive director of the Tennessee State Employees Association, said Friday he's been "indirectly" told "they're going to do what they can to find those employees work, maybe even with the Department of Transportation" during the interim. Stamps said the administration needs to address such issues with major inn replacement or renovation projects also slated for Montgomery Bell State Park near Nashville and Paris Landing State Park near Clarksville.